The once mighty super typhoon has weakened to a depression in the South China Sea as it heads for a final landfall in southern Vietnam. NASA's Aqua satellite captured an image of the storm that showed it was weakening. NASA's Aqua satellite passed over Hagupit on Dec. 11 at 05:20 UTC (12:20 a.m. EST) and the MODIS instrument captured a visible image of the storm. The MODIS image showed that the thunderstorms had become fragmented around the circulation center. On Dec. 11 at 1500 UTC (10 a.m. EST) Tropical Depression Hagupit's maximum sustained winds dropped to 30 knots (34 mph/55 kph). 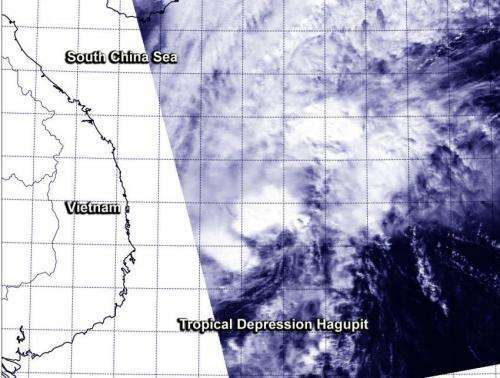 It was centered near 12.8 north longitude and 110.9 east latitude, about 314 nautical miles (361 miles/581 km) east-northeast of Ho Chi Minh City, Vietnam. It was moving to the west at 8 knots (9.2 mph/14.8 kph). Hagupit is moving west-southwest toward southern Vietnam, where final landfall is expected around Dec. 12 at 0000 UTC. The system is forecast to dissipate quickly after landfall.